Things could be worse – What's wrong with me? I visited the rheumatologist again today. There wasn’t really anything more for us to talk about since mostly the pain in my joints resolved a long time ago. He bent my wrists and elbows in a few different directions, advised me to slow down even more and not to expect to get any better over the winter. ‘Perhaps the spring will bring good news for you’ he said as he signed me out. The other night, sitting at the computer researching paresthesia, I felt the pins and needles getting worse as I typed and clicked. I was twitching and itching and feeling stabs all over my legs, shoulders, arms and scalp. It’s unpleasantness was incredible. I’ve found a great number of names for things that I have had in the last five months. Peripheral neuropathy is a good one. My doctor described it as the body’s radar system gone haywire. 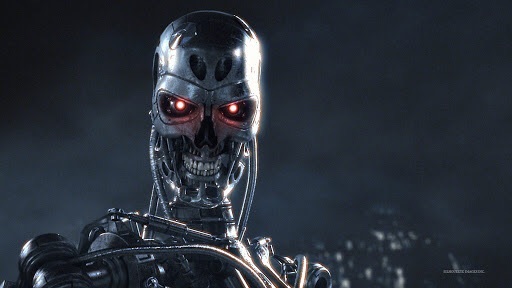 I imagine my immune system like the Terminator, bared down to its shiny skeleton, it’s bright red eye searching endlessly for nerves to terminate. I’m still amazed that this syndrome is so poorly understood and I’ve decided to keep all my blood test printouts so in a couple of years – maybe 5 maybe 10 -when they find out what this is I’ll be able to look back over my results and see the answer. But now I’m starting to think I just need to give in and get over it. Watching Struggle Street on SBS tonight, even with all the hype around it being a beat-up I still felt for a lot of the people. I spoke with a customer this afternoon to told me some bad news. She screwed up her face and whispered whenever she had to say the word, cancer, like it was a secret or a swear word. All of this doesn’t make me feel better or worse just maybe a little self-indulgent. It reminds me that I could be a lot worse off. I feel like I want to stop writing this blog but I promised myself I’d continue until I was 100% again. And that sure ain’t here yet.